As a teacher, you will step into many different roles. You will be an educator, who can share personal experiences. You will be a guide, who finds solutions and shows students the right way of doing things. You will be a motivator, who makes things possible. You will learn to comprehend the needs of your students and do your best to fulfil them. This is not just a way to acquire crucial social and professional skills and to boost your CV but it is your chance to shape the life of students, to support, help and give back to society. You will get a lofty payment, sponsored private room, support around the clock, intensive training to prepare you at your best and you can even ask for more. Type of job	 English School Teacher in China. Accommodation Furnished apartment on campus provided. Location of job placement Beijing & central China. Duration of the placement	 6 or 12 months including 2 – 4 months travel during school brakes. When to apply? Placements start at February 2011 and August 2011. No university or college education required. 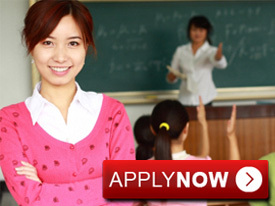 You will be placed as an English language teacher in high schools, kindergartens or English training centers. Schools are located in Beijing and central China. Working hours will be 20 to 25 hours per week plus preparation for classes. The workweek comprises 5 working days. The duration of the whole programme is from 6 - 12 months, one semester or a full academic year plus 2-4 months for your travel adventure. For the first 2 or 3 months, depending on the total duration of the programme, the participants will earn a monthly salary of 2000RMB ($290) and for each following month 4000RMB ($580) to 6000RMB ($890) depending on qualification. Compare: An airline pilot in China is earning on average $761 per month. Candidates with a university degree, TEFL/TESOL certificate and no accent qualify to earn the highest salaries. Participants will be provided with a fully furnished private room free of charge, sharing the apartment with other foreign language teachers. Meals may also be provided, depending on the school’s service. The apartment will be located on campus. Please note: Placements can be arranged either in Beijing or in central China. Candidates can make a specific location request and we will do our best. However, we cannot guarantee a certain location. Accommodation, rate of pay, working hours and language course options will vary depending on the employer and the location.